Need shiso? Well I’ve got it. “Shi’ what?,” you say. You are absolutely clueless as to what shiso is? Ever eat sushi? And if so you ever wonder what the heck that bright green (‘oh I hope it’s not ‘stinging nettle’) leaf garnishing your platter of raw fish. That my friends is a shiso leaf. Don’t be shy, give it a try. This ruffly edged leaf, like basil, is a member of the mint family. The taste? Kind of minty, kind of basily (hum, new word? ), kind of fennelesque (oh, number two), or anisey (did I hit number three? ), and throw in a bit of cinnamon and citrus for good measure. All in all, pretty interesting flavor. And good for you too: full of anti-inflammatory properties, vitamins and minerals. According to Chinese medicine shiso can give a serious boost to one’s immune system. All. For. That. After curiosity got the best of me, I finally tried the ‘sushi garnish’ wrapped around a piece of raw salmon. Wow. Forget the garnish bring me some more please. I have found shiso at the farmer’s markets (try Henry’s Farm at the Evanston Farmers Market), but with my wee plot of land I thought I should try growing it myself. Now, like basil I learned that shiso likes a warmer summer, so last summer perhaps not the best to try my hand at growing the stuff. Think I yielded one plant. Now fast forward to this summer (yay, perfect conditions), after composting the old soil and the plant…perhaps I should have done some research to realize shiso reseeds itself. Alot. So my offer stands. 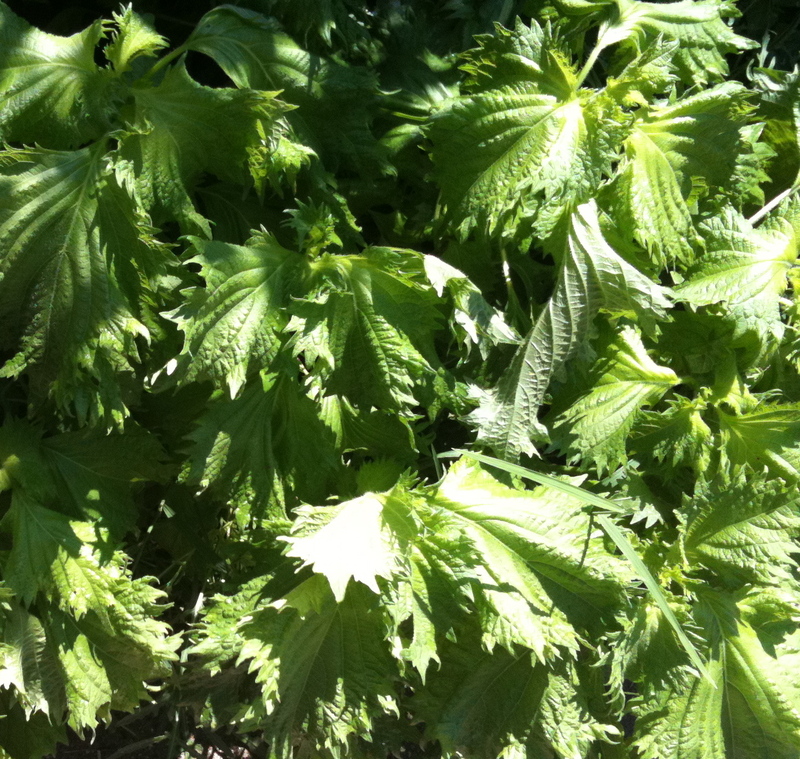 You want/need shiso? Let me know. I have TONS! Still not sure if you need some? So many ways to actually enjoy it: replace your mint in your iced tea or mojitos….sooooo refreshing. Silver thin strips and add to salads, pasta, top grilled fish or meat, or a stir-fry. Use the whole leaf as wrap (like lettuce) to sandwich fish (raw or cooked), chicken, or beef, or tofu, or better yet, as a spring roll wrap. Change up your next pizza and swap shiso for basil (or is that basil of shiso, always get confused). Add to soups, rice or fry it tempura style. But have to say my FAV way to enjoy shiso? 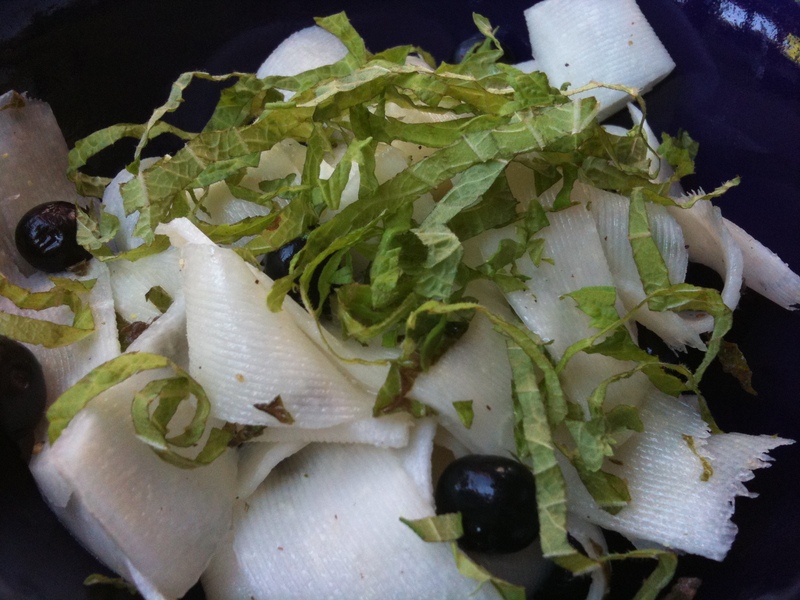 Wrap a leaf around a piece of feta cheese, and pop in your mouth. Taste bud changing. Thank you Chef Lisa for that one! Using a vegetable peeler, shave strips of the entire head of kohlrabi into a bowl. Add the remaining ingredients and toss together. Seriously simple. I mean, who really wants to cook on a hot day? 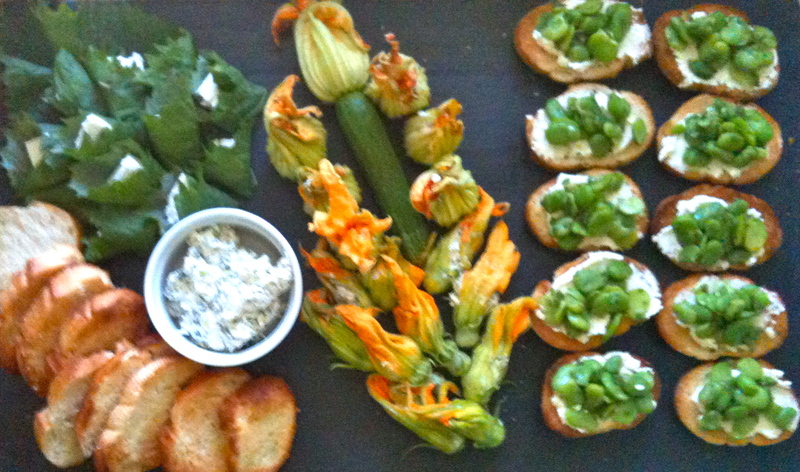 This entry was posted in Uncategorized and tagged blueberries, Chicago Farmer's Markets, Evanston Farmer's Market, fresh organic, Girl and the Goat, Henry's Farm, kohlrabi, moira's blog, Old Town Olive Oil, Shiso, Stephanie Izard, sustainable, to market with mo. Bookmark the permalink.